High blood pressure (hypertension) is extremely common in western society. As we age, the incidence of hypertension generally increases. 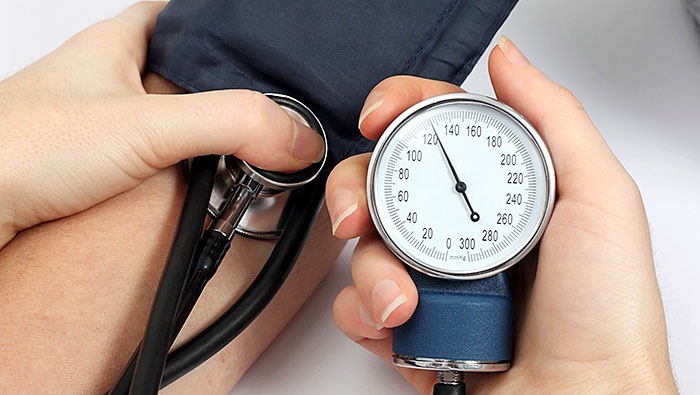 More than 50% of our population over the age of 60 has high blood pressure. This increases to approximately 90% of our population by age 80-85. Hypertension can increase risk of significant cardiovascular and kidney disease, so it is important that blood pressure is maintained between <130/85 and <140/90 for people over 65 who do not have chronic disease complications. Medication is an important and effective treatment, however, there are dietary and lifestyle factors that should be addressed in order to achieve an optimal blood pressure. There is strong scientific evidence that weight loss can decrease blood pressure. If overweight, losing body fat can reduce blood pressure in the range of 5-20mmHg per 10kg lost. Weight management can be the difference between normal blood pressure and hypertension. Aim to achieve and maintain a healthy body weight with a waist circumference of <80cm for females and <94cm for males (<90cm Asian males); or if you are overweight aim to lose at least 5-10% of body weight. Consult your GP or dietitian for support regarding healthy weight loss. Regular exercise or physical activity can reduce blood pressure independent of its weight loss effects. A reduction of 2-4mmHg can be expected by initiating an exercise routine such as a 30 minute walk or bike ride five days per week. Most people require a minimum of30 minutes of moderate to vigorous intensity exercise, on five or more days per week, to achieve health benefits of regular exercise. Consumption of sodium in the form of salt (sodium chloride) in the western diet is one of the most significant causes of age-related hypertension. Sodium is available in many forms such as rock salt, sea salt and garlic salt, and monosodium glutamate (MSG). There is no benefit in choosing sea salt or Himalayan salt over table salt. Approximately 80% of the sodium in a typical western diet comes from processed foods, while 12% is naturally occurring in food, and 8% is added in cooking, or at the table. Choose packaged foods that are labelled as “salt reduced” or “no added salt”, and read the nutrition information panel to select low sodium foods with 120mg of sodium per 100g or less. Australians consume sodium at a level that far exceeds the recommended daily intake of 2,300mg per day. All Australians, particularly those who have hypertension, should aim to reduce their intake. Choose fresh foods as often as possible to limit sodium intake. A high intake of fruit and vegetables is directly associated with reductions in blood pressure. Studies show the greatest positive effect on blood pressure occurs in people who eat at least 9 serves (about 5 cups) of fruit and vegetables daily. High dietary potassium, which is found naturally in fruit and vegetables, opposes the effects of dietary sodium and has a beneficial effect on blood pressure. Frozen and canned fruits and vegetables are good alternatives to fresh produce, but please ensure they do not have added sugar or salt. Consuming a low fat diet (<30% of energy intake) and limiting intake of saturated fat (<10% of energy intake) is recommended for most people and has a beneficial effect on blood pressure. Choose products that are labelled as “reduced fat” or “low fat”, to reduce intake of total fat and saturated fats. Two to three serves of oily fish (salmon, sardines or tuna) per week can be of benefit in people with hypertension. High strength fish oil supplements are also effective in improving cardiovascular health Ask your pharmacist for a product that provides 3g fish oil per day. Three serves (about 3 cups) of low fat dairy food per day is consistent with lowering of blood pressure. Non-fat or reduced fat milk and yoghurt is recommended for daily consumption, however ice cream and hard cheese should be limited as these are energy dense foods. One serve of cheese is equal to 40g (2 slices) whilst a serve of ice cream is 100g (2 scoops). Choose reduced fat ice cream and cheese, and limit to 4 serves per week. Individuals who consume 3 or more alcoholic drinks per day experience hypertension at a level 3 times higher than non-drinkers. Binge drinking is linked to a higher incidence of cardiovascular death and stroke, and alcohol directly increases blood pressure and can interact with some medications. Alcohol is high in kilojoules and is often a major contributor to being overweight or obese, thus both directly and indirectly contributing to elevated blood pressure. Each standard drink (10g alcohol) increases blood pressure irrespective of the type of alcoholic beverage and although the flavonoid components of red wine are beneficial to health they have not been shown to reduce alcohol related hypertension. Australian adults should consume no more than 2 standard drinks (20g alcohol) on any occasion to reduce lifetime risk of harm from alcohol-related disease or injury. Smoking directly causes constriction of blood vessels, which directly increases the pressure exerted on your blood vessels when your heart beats. Therefore smoking directly increases your blood pressure. Smoking cessation (or never starting) is of great benefit to sufferers of hypertension. Speak to your GP or pharmacist about smoking cessation options. Acute emotional stress is known to increase blood pressure. Relaxation techniques such as meditation, yoga and tai chi can greatly benefit overall health and reduce hypertension. By making these diet and lifestyle changes you can significantly lower your blood pressure, and you can enjoy many additional health benefits!